Centifolia Organic Sweet Almond Oil is an excellent care that nourishes and protects the skin of children and adults. Rich in fatty acids, vitamins A and E, the oil is known for its softening, moisturizing and soothing properties. Ideal for the cracking of the hands or breasts of young mothers, it is suitable for all skin types. Centifolia 100% Pure Sweet Almond Oil leaves your skin soft like baby skin ! Fortifies & softens the skin with CENTIFOLIA Sweet Almond Vegetable Virgin Oil! Apply the sweet almond oil to the body or hair and massage in gently. Store in a cool, dry place away from light. Sweet almond oil solidifies at a temperature below 25°C. This does not affect its quality. To use it, pass the bottle under hot water. 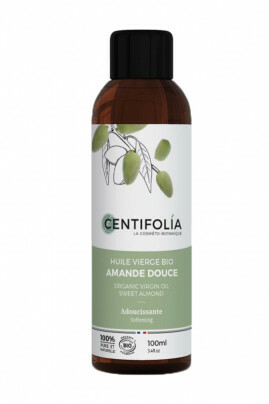 100% natural composition, guaranteed without phthalate or Bisphenol A in sweet almond oil CENTIFOLIA!